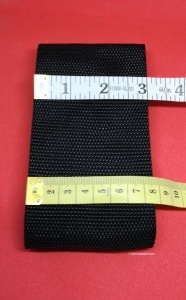 Here you can see some of our webbing from 9mm(3/8") wide to 100mm(4") wide. Other sizes and options are also available, if you cant see what you want please contact us for help. We are trade suppliers and can customise many of our webbings, tapes, ribbons and elastic to order. If you cannot find exactly what you require please email us with the details. 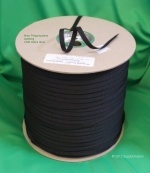 25mm Black Light-weight Polypropylene webbing. Used for binding and light-weight straps etc. 50mm Herringbone weave(seatbelt type) PVC coated Polyester webbing.